Where in the world can you find more than 200 people working in one classic car restoration complex – with vast hangar-like halls for bodywork, for Jaguar, for Rolls-Royce and Mercedes, for future projects and more? Surprisingly, the answer is not the United States, UK, Australia or anywhere in Europe – it’s the Philippines, on the former US airbase that is now Clark Freeport Zone, writes Malcolm McKay. 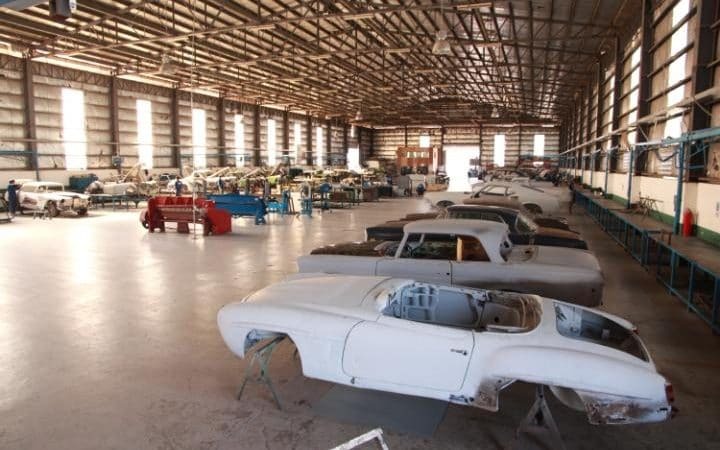 The idea of Australian businessman Jim Byrnes, the Byrnes Motor Trust Restoration facility was established six years ago. Choosing a location where workers are skilled and dedicated, but labour rates are a fraction of those in the world’s main centres of classic car enthusiasm, meant that Byrnes could get his burgeoning collection restored well but cheaply, commissioning restorations in batches for economies of scale. Byrnes’s classic car credentials are clear. “My first job was in the car industry in 1976. I’ve had the smell of oil and rags in my blood for 40 years,” he says. “Car collectors are addicts – the sound, the feeling, the wind in your hair – I like cars that were engineering feats. I love things made with blood, sweat and tears. 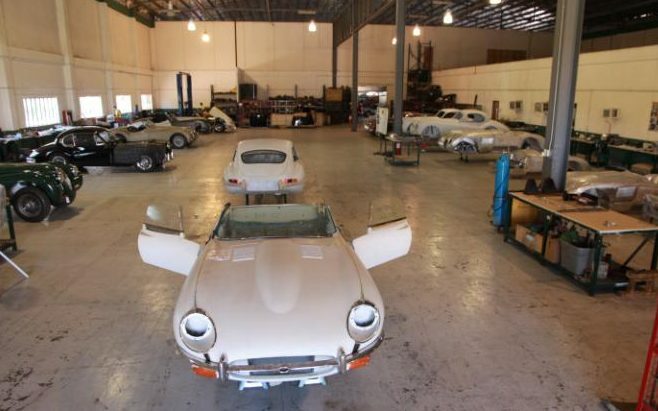 Jaguar E-types, early Porsches, Rolls-Royce, it’s important to preserve them. Byrnes explains that the business started with 35 project cars, but grew to 400 within two years, as space permitted. To keep up with the work rate he headhunted from “companies that produced top-quality restorations”. Of those clients, one has recently bought the second-ever right-hand-drive Jaguar XK120, and E-type no 16 (also right-hand drive) is on the books, too. By the end of this year, 50 per cent of BMT’s work will be for external clients. He explains that BMT has pressing facilities in Poland that makes a lot of new panels. The company hss also reproduced the original Dunlop brake calipers for C-type, XKSS and D-type Jaguars. On his travels he has been sourcing the original, sand-cast Weber caburettors for the C-types being restored. On one trip he bought 37 Jaguars languishing in a scrapyard in Texas, of which BMT managed to reassemble five. “We’ll also build 10 alloy XK120s. We’ll put cars back on the road that otherwise would’ve been lost forever,” says Byrnes. The expanding Chinese market is an important one to BMT. “Predominantly cars have to be easy to drive – early 911s to 993s, 356, 190SL, E-type, Aston, Bentley Continental,” believes Byrnes. Cars older than that, such as Rolls-Royce Ghosts and 4.5-litre Bentleys, tend to be used as exhibition pieces. Byrnes shows me around the woodworking shop nearby. Next door is an Aladdin’s cave of cars to restore, with a row of Rolls and Bentleys, another of E-types and XKs, another of MGAs, MGBs and Sunbeam Tigers. “Every cheap MGB I see, I buy it,” he says. “I’ve got eight twin-cam MGAs.” There are also 40 Ford Mustangs from 1969-70, and 30 Mustang convertibles from 1964-65, which BMT will fit with modern mechanicals for a hire company in California. Byrnes is also in talks with Carroll Shelby about building 50 Trans-Am Boss Mustang replicas. Also visible are a ’57 Chevy Convertible and a Camaro, alongside a Ferrari 330 2+2 chassis. Byrnes stares across the vast hall full of derelict cars. Anyone else would be in despair at the work required to complete even a quarter of the vehicles at the facility, but he already has as many lost causes under restoration – these will move on before long, with many more en route to the Philippines. He has a reputation as a tough businessman in his home country, but his passion for classic cars is unmistakable. Could it be his one weakness? Certainly the number of completed cars is smaller than one might have hoped, but Byrnes is unfazed and full of enthusiasm for his team. The company’s chief executive, Jason Lemberg, 43, came to BMT after running the restoration department at Symbolic Motors of California, where his restorations twice won “best in class” at Pebble Beach. “The workers have a real passion and attention to detail,” he says. “There’s a worldwide shortage of good metalworkers and the locals are incredible. We’ve got 45 female workers, too, from mechanics to metalworkers. “In the US, many restorers compromise restorations because of labour costs – that’s not an issue here. Of course, we have to do a fair amount of training to hone their skills – all are self-taught or have learnt from their fathers or relatives. “The only finished cars they’ve seen are the ones they build, so we use movies in the canteen to show them the standard required. Paint shop manager Carl Holland brought almost 30 years’ experience from the UK, where he worked on custom cars as well as conventional paintwork. The sheer scale of operations at BMT Restoration is breathtaking. Provided the last remaining teething troubles are addressed, the future looks bright, especially when the Chinese market opens up just across the water.